If you've got a mobile phone that supports custom ringtones, and you want some of that old-skool arcade goodness, check out ArcadeTones, a site with ringtones ranging from Pac-Man to Grand Theft Auto 3. What should show up in my mailbox yesterday but a copy of the BrookStone mail order catalog, and right there on the back cover was a row of nice, shiny new arcade machines for sale. They've got new "cabaret" cabinet-style combo remakes of classic games such as Ms. PacMan/Galaga, Robotron/Joust, and Space Invaders/Qix. (oh, yeah, and a brand-spankin' new Golden Tee 2005 machine if you want it ;-) It may not compare to a well-crafted MAME-machine, but it's nice to see the classics continuing to be built and sold. Read this amazing story, entitled "My Best Find." Shed a tear, smile, and share it with someone else. Yes, you too can build your own arcade — in paper, at least. Behold the Paper Arcade, a collection of paper templates that allow you to create your own miniature arcade cabinets. Templates are available for a variety of arcade games, including my favorite, Robotron. Print out a template or two, cut them out, put them together, and you've got your own "desktop arcade." Hot off the RePlay news page, it seems that Happ Controls is about to be bought by an outside group of investors. I have no idea what this could mean for the future of the company, but it'll be interesting to see if this leads to any changes in the company. Okay, as promised I've just posted the Hamster Ball written review to the RetroBlast Software Reviews page. I take a detailed look at this ambitious update of the arcade classic Marble Madness. There's a new joystick option for the Devastator II controller from Treyonics: the OmniStik Prodigy from GroovyGameGear. The OmniStik Prodigy is a top-switchable 8/4 way short-throw joystick (soon to be reviewed), and it looks to be a nice addition to the Devastator II layout, especially for those who want a quick and easy way to switch between normal 8-way joystick games and 4-way games such as Pac-Man. In my quest to find an arcade monitor to replace the troubled WG D9200 on my recommendations list, I just found the Betson Imperial 27" Multisync arcade monitor (page 84, part 44-4070-40). Hey, is this mainstream or what? The June 2004 Popular Science includes a short article on building a MAME cab! Nothing new, and I have to laugh at their "keyboard encoder", but it's still nice to see retrogaming popping up everywhere all of a sudden. On the Web — It's a Site, It's a Mission, it's GamerDad! If you're a computer gaming enthusiast with young children (as I am), check out GamerDad, a site tailor-made for those of us who have kids and are still kids ourselves. They've got reviews of children's software, and nice forums to help you pick the best game for your children. More proof that what's old is new again, especially with arcade gaming. Behold the Flexarcade, a PC-based arcade gaming system that allows PC game developers to easily convert their PC games into an arcade-based system. In other words, that cool retro-styled PC game that was inspired by an old arcade classic may just show up in an actual arcade! Okay, after a few production mistakes forced me to restart the project twice, the video review of Raptisoft's most excellent Hamster Ball is now online. Scurry on over to the Video Reviews page and check out this modern take on the arcade classic Marble Madness. The written review will follow in a day or so. A warning: it's addictive — trust me, it was hard enough pulling myself away long enough to do the review! Okay, in preparation for the upcoming BYOAC Tokens, I've converted both the MAMEframe2 and my pinball machine over to token operation, installing .984 token mechs and I even got a deal on a bunch of Chuck E. Cheese tokens, so I already have a fishbowl full of tokens! I've still got to wire up the coin door in the MAME cab to the IPAC, but after that both machines will be completely token operated. I'll be documenting all the steps I took to covert over to token operation, so look for an article/video combo sometime in the future. I've got a couple of additional tidbits about the NeoTec Graphic NT-500DXB7 monitor. First, the good news — according to reader Godot Gutierre, the monitor is available direct from NeoTec Graphic for $440 + shipping, much less than the $499 quoted at Wico. And now the bad news — apparently, it seems that the monitor cannot auto-switch between 15Khz and 31Khz video modes like the D9200. There's still a little bit of confusion about this fact, however, and I'll see if I can't nail this down a bit more. Yup, if you've got a copy of Half-Life and have installed Steam, Valve's online content delivery system, you now have access to "Codename: Gordon", a side-scrolling platform jumper based on the Half-Life world. Control Gordon Freeman as he climbs, crawls, and jumps through an exciting all new adventure, and see what Half-Life would have been like in glorious 2D instead of that old, boring 3D! MAMERoom Cab Kits Now Available! The "Basic" kit will be available before the end of May 2004 and includes professional milled (CNC) cabinet panels made from 5/8" MDF, pre-drilled countersunk holes and pilot holes, and assembling hardware. The basic kit comes "unfinished". Future add-on options will include a choice of finish (color laminate). The basic kit does not include a control panel. Currently, only the 25" wide version of this cabinet will be available. This will fit up to a 27" WG D9200. 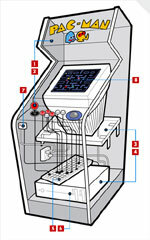 The Ultimate Arcade II cabinet kit is based off of the step-by-step construction manual available here: http://www.mameroom.com/order_uaII.asp. Pre-order a "Basic" kit for the introductory price of $299.00 + Shipping & handling. To reserve a kit at this introductory price, send an email to info@cybertechdesign.net. So, What is Eugene Up To? As a devoted "Disciple of Robotron," I have always had an ongoing interest in everything that Eugene Jarvis, the creator of Robotron, has been up to. Thanks to a post in Alt.Games.MAME by the Pinny Parlour, I now know that Eugene has formed a new game studio, Raw Thrills Inc. The site has some details about their upcoming games and some nice interviews with Eugene as well. I've heard back from represenatives at both Hanatrex and NeoTec Graphics about their arcade monitors. Unfortunately for those of us in the USA, Hantarex does not have a US distributor, althought their Polo Star monitor is probably a great choice for those in the UK or Europe. NeoTec Graphics' primary US distributor is Wico — they have the NT-500DXB7 available for $499.99 (no word on shipping costs). Unfortunately, I did not get any more detailed specifications on their monitor, but it does look to be a "drop-in" replacement for the D9200. Just ordered one of the Neotec monitors. Will post review once we get it in. Used quite a few 9200's and only had video problems with one, but had light gun problems with all of them. Talked to the support at neotec and they assured me the act labs light gun works properly. Plus the neotec monitors supports 800x600 and will also run at 1024x768 according to the tech support. There are two versions of the 27" neotec monitor. Website only list the RCA model but they have a Phillips model also which has a flatter screen and according the to tech support has a better picture. Replace the "B" in the part number with a "P". NT-500DXP7. Okay, so shoot me — I got a joystick review done early for once. Now available over on the RetroBlast Reviews page is one more piece of the Joystick Roundup puzzle, namely a review of the Happ Controls Competition Joystick. I've also updated the Joystick Comparison Chart with a new measurement, the range of motion in which diagonals are possible. By the way, don't expect two joystick reviews every week, as I still fear "The Joystick Roundup Curse"! Thanks to an email from Gibson Lanier, I now have news of another possible D9200-equivalent arcade monitor to report on. The Hantarex Polo Star monitor looks to have similar specs to the Wells-Gardner D9200, which means hopefully it may prove to be a viable replacement for the versatile but trouble-plauged D9200 monitor. Once again, I'm looking into it, and I'll report back once I've gotten some more information. I've been getting an increasing number of emails from distraught Wells-Gardner D9200 owners, recounting their tales of shipping damage and early failures (I myself experienced a board failure two weeks after I got my D9200, but it's been very reliable since then). When the D9200 works it's a great monitor for MAME cabs, as there aren't many monitors out there that can handle the 15Khz video put out by video games and the 31-38Khz video used by PC video cards. But that's the rub: when it works — there have been far too many D9200 problems for me to dismiss them as a one-time fluke. Thanks to reader Tony Papa, I may have another monitor to recommend: the NeoTec Graphic NT-500DXB7. It's a 27" arcade monitor (they have sizes ranging from 19"-36") with the same specs as the D9200, except that it is also able to support 800x600 officially (the D9200's official max is 640x480). I don't have any more details, but I'm going to look into this a bit further and I'll report back what I find. Note: Some readers suggesed the Happ Vision Pro monitor as a D9200 replacement, but the specs do not mention 15Khz or 25Khz video modes, two modes that are (in my opinion) critical for good MAME video output. The Ultimarc ArcadeVGA card, for example, defaults to 15Khz video. Yes, yet another insanely addictive modern remake of a classic, Hamster Ball by Raptisoft is an extremely slick remake of Marble Madness, with lots and lots of 3D graphic goodness. I've just started playing around with the demo, and I'm already hopelessly hooked. This is a great update to a favorite classic, and worth checking out if you enjoyed Marble Madness "back in the day." Special thanks to Greg Thorpe for pointing it out! My name is Steven Dent. My disability is Cerebral Palsy. I am in a wheelchair and my hands don't work. I enjoy playing video games. I send a e-mail to Sony and I ask them, can they make me a big analog joystick controller but I got the run around. They said, they can't help me. I can't use the small analog controller that comes with the video game system because I can't hit those little buttons with my wrist and elbows. I use a digital Shadowblade joystick controller for Playstation 2 but 90% of video games are analog now. It is very frustrating for me. Can you put 2 analog sticks in the Shadowblade joystick controller? Can you help me? Please!! You are my last hope. I'm going to try and do some research on this, but I don't have any answers yet. If you have any suggestions or solutions, please let me know and I'll forward our findings to Steven. Don't let a fellow gamer down! Another joystick review is now ready on the RetroBlast Reviews page, and I've also updated the Joystick Roundup Chart with the results from my latest round of testing. More joystick testing is underway, so there may be more joystick reviews just around the corner if I can find a bit more time to polish everything up. I've also got some video of my test procedures, just so you know what I'm doing to get my results. If you've been following the custom token project over at the BYOAC forums, now's the time to vote on the both the front artwork, the "functional text," and the slogan on the back of the token. Update: The polls have closed, and the final design chosen. Check this BYOAC thread for the winning results. Visit this thread for details on ordering yours. Yes, another update to my favorite front end, MAMEWAH, has been released. For such as small increment in version numbers, it's got an incredible number of new features, including support for up to fifty (yes, 50) emulators. It's also got extensive support for the controls.dat project. If you haven't heard of the controls.dat project yet, let me explain. It's an ambitious effort by the MAME community to create controller definition files that document what the specific controller layout was for a particular game (i.e., what button does what). The controls.dat file can be used by MAME front ends to display the controller layout for a game when that game is launched, or even light up the buttons used (such as the now M.I.A. LAME Arcade project). If you're interested, be sure to check out the Controls.Dat Forum. Version 0.7.7 of David Butler's great MAMEWAH Setup utility is now available on both David's web site and the RetroBlast File Downloads page. This version brings MAMEWAH Setup in line with MAMEWAH 0.97. If you use MAMEWAH, you owe it to yourself to check out this program for quickly setting up multiple emulators and artwork. By pure coinidence, I happened to stumble across the Saturn "Pacman" commercial I mentioned in the recent RetroBlast article on Retrogaming and TV Commercials while watching a show last night on my ReplayTV. Since I've got the amazing (and free) DVArchive program handy, I easily pulled the commercial off the ReplayTV to my PC over my home network and have now output it as a high-quality video file. If you'd like a higher-resolution look, please feel free to jump to the article and have a peek. I'm always impressed with the knob designs that keep coming out from SlikStik — their knobs are unique, and the designs always seem to balance style and gameplay. The Ultimate Portable MAME Solution? Here's some very intriguing E3 news from ExtremeTech about a new portable gaming console called "Eve" that uses Windows XP embedded, and according to it's creators it will be able to play regular PC games! My first thought (as well as, I'm sure, many of you reading this) was "that would make a great MAME platform!" It's a bit pricey ($500), but it certainly seems worth watching to see how this develops. If you saw my mysterious post last month, I had plans for another strange looking light system. Well, it didn't work out. Hopefully this one will, but it looks like it will take a lot of work. I'm going to remain cryptic until I see if I can get everything working. If it all works out, I'll be putting up an article documenting what I did and why. Need Top-quality Vector Arcade Art? Be sure and check out the Arcade Art Library, a great collection of artwork, most of it in vector format for perfect scaling to any size. All of the artwork is by contributors, and it looks to be a great resource for MAME cab builders and restoration projects. The Arcade Art Library has fonts, character art, bezels, sideart, instruction cards — you name it, if it's arcade related, it's probably in there. Stop by and browse through all the pretty pictures! And the results aren't half bad! I've just finished up an article about the new wave of commercials with a retrogaming theme, everything from Asteroids to Pac-Man, even pinball. I've even got videos of all the commercials mentioned. Steve's been in contact with me for quite a while about the design of his custom "System 1M" cab, which is based on the Atari System 1 cabinet design (which is the same cab I used for my original MAMEframe cab). His cab is almost finished, and it looks like Steve's made some really great refinements to the original Atari design — it looks fabulous. Congrats, Steve, on your new baby! Steve is going to be working on a new update, and is actually taking suggestions for new features you'd like to see added. If you've got a great idea for a feature, be sure to drop in on this BYOAC thread and let him know what you would like to see. In this case, I just got some wonderful feedback and suggestions from John Laur about the joystick roundup reviews, including a request for another test, the "diagonal degrees" test (my terminology, not his) Basically, I'm going to try and chart out what portion of a joystick's range of motion engages the diagonals. It's a great test suggestion, and I''ll be adding this test to the mix this week. Thanks, John! If the thought of having some custom game tokens for your arcade cabinet sounds interesting, be sure to check out this token discussion thread over on the BYOAC forums. A group of enthusiasts is working to get enought people together to order custom artwork game tokens. I've thought about switching my machines over to token use, as I could then use the MAMEframe2 as a "reward" for my kids (you know, do a chore, get a token). If it'd get them to clean up their rooms, it'd be worth it. Well, better late than never! After video capture problems and a month delay due to back surgery, the long-promised Storm Angel Video Review companion to the written Storm Angel Review is now finished. If you're looking for a great side-scrolling shooter that also happens to feature great 3D-accellerated graphics, this is your game. I've had a blast playing it, so be warned: the "addiction factor" is high on this one! The Storm Angel video footage was grabbed using Fraps, a great tool for capturing screenshots and video of games in action. It's a great tool for MAME users, as well, as it provides an on-screen frame rate display. The built-in FPS (Frames Per Second) display in MAME isn't reliable in my experience, as games sometimes actually slow down when the FPS display is turned on. Fraps does not cause any slowdown and provides a more accurate reading. John Lundy keeps on creating neat new MAME cab add-ons — this time it's a Q-Bert Knocker, just like in the original Q-Bert cab. There are a lot of great electronics for MAME cabs documented on his site, so if you haven't visited John's Retro Arcade site before, be sure to drop in for a visit. And I'll be updating the Joystick of the Week review tomorrow with the test results. Let's hope this works out the way I hope it does! Okay, the first "joystick of the week" review (complete with video "snippets") on the main Reviews page. I take a look at the Wico Leaf Switch joystick, a classic joystick that is no longer in production. Just a friendly reminder — if you're still using a bookmark of the front page of RetroBlast made before 4/14/04, you're probably still getting the 404 Error Page when you visit. Just click on the link in the error page message and then re-bookmark RetroBlast, and all will be well. You know it, you love it, all good things flow from its source...okay, enough with the hyperbole! MAME 0.82 has been released — hop on over to MAME.net for the regular versions, or over to the official MAME32 site for the Windows-GUIfied version. What on earth is that for? Some of you may recognize what it is, but if you don't already know, it's a digital fishing scale. To jump ahead and answer your next question: "It's for the joystick review, of course." (pause) "To measure the force needed to engage each of the joysticks" (another pause) "Because a real linear scale would have cost nearly $400!" If you're looking for a 3D update on the vertical-scrolling shoot'em-up genre, check out AirStrike3D. I've spent a couple of days trying out the demo, and it's got a good "arcade vibe" (not to mention it works great with the arcade controllers on my MAME cabinet!) Between this game and Juno Remix, it's a wonder I'm getting any work done at all. A special thanks to Greg Thorpe for pointing it out! This Week's "Joystick of the Week"
I'm going to kick off the Joystick of the Week reviews with an "oldie but a goodie," the original Wico 8-way leaf-switch. I'm currently doing the testing and photography, so look for the review (with video snippets) in the next day or so. Tired of using a joystick to play video games? Want something more aerobic? Check out the PacManhattan game recently played in New York City. It's cool and pathetically geeky in the same breath. I've heard stories about a site getting "taken down" accidently by a flood of hits after being mentioned on Slashdot, but this is the first time I've seen it in action (and it's my own site!). I received some excessive bandwidth usage warnings this morning (strange for the third day of the month), and sure enough, tracking down the cause I discovered that RetroBlast's video clip of Seinfeld's "The Frogger" episode is being hit hard, thanks to this Slashdot discussion link about "PacManhattan" (see news above). Hopefully demand for the clip will fade soon, or I'll have to pull the clip from the site temporarily to avoid exceeding my monthly bandwidth allotment! - system tray icon with popup to play "at office"
MameBench V1.2 is an easy to use tool for automating benchmarks without messing up your existing configs. It creates results both with and without D3D. After it completes, look in the BENCHMRK directory for the output. Now (probably) compatible with all MS OSes >= DOS5.0. Supports all (tested) MAME builds and versions (including DMAME). Manual cleanup of output files is required for all non-32 builds. The article on adding sound to your arcade cabinet (to accompany the Sound System video I released a couple of days ago) is now ready. More details on how I added sound to my MAMEframe2 arcade cabinet. Killer sound makes for a killer gaming experience — after all, arcade games just aren't the same without a good "thump" of bass in the chest each time you kill an attacking space alien! I realized that I had never posted a picture of how the coindoor on my cabinet looks now that I've finally gotten some 4-LED red lamps from SuperBrightLEDs to install. The result is exactly what I wanted — a bright, red glow, just like the old coin door lights in the 80's. I've updated the Hardware Section of the MAMEframe2 Construction Diary and the SuperBrightLEDs review with the results. Yes, version 1.32 of PinMAME has just been released. If you're a fan of the Visual Pinball/PinMAME programs, check it out. I've found VPinMAME to be a great way to "try out" pinball machines and help me decide what my next pinball acquisition target should be.